Boy Oh Boy, What a Burger! Although I would like to be a step ahead of the local media, in my quest to find the best burger I just do not have the time and resources to cover the Sacramento area and beat the press at finding the little treasures out there. Instead, most of the time, I end up getting ideas for new stories from the Sacramento Bee, Yelp.com, UrbanSpoon.com, and BurgerJunkies.com. The very good and very filling Stevie Boy Cheeseburger. 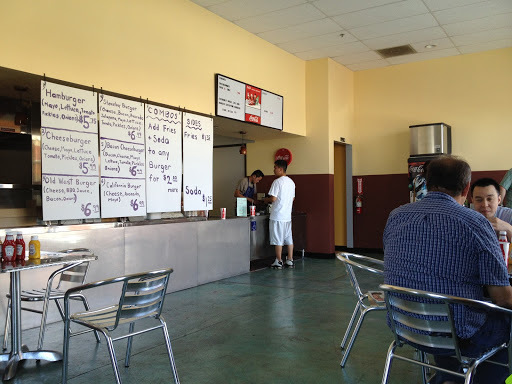 Stevie Boy Burgers, at 6036 Stockton Blvd in Sacramento, received a great review from the Bee on August 30, 2012, and I had to follow up. My first attempt at checking out this place was on a weekend; however, contrary to a usually trusted source (I won’t get nasty and say which one), Stevie Boy is closed on the weekend. So, like Whitey’s Jolly Kone in West Sac, getting to the place when it is open was difficult. 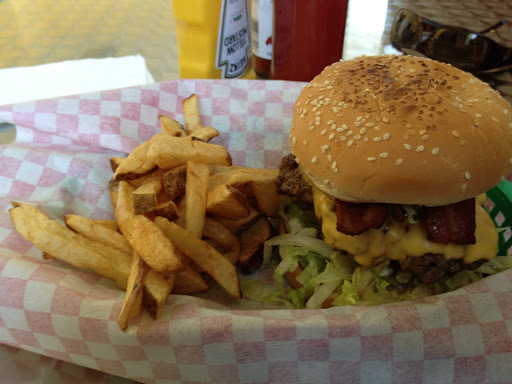 As of this posting on the blog, Stevie Boy Burgers is open from 11 a.m. to 8 p.m. Monday through Friday. 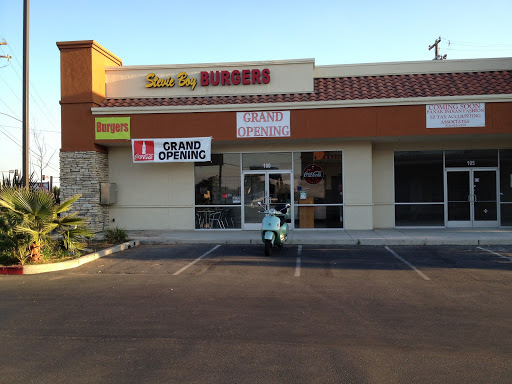 Stevie Boy Burgers is in a storefront like the Power Inn Road Squeeze Inn, but is difficult to locate from the road. On the inside, the décor is as sparse as the menu—about five tables in an echo-chamber of a dining area. The menu consists of just six burgers, all variations of a core hamburger. The only side is fries and, of course, fountain drinks. I ordered the Stevie Boy Burger combo with fries and a drink. The burger was $6.99. An additional $2 made it a combo, which was a tough two bucks for me because the fries are horrible—steak fries of poor quality even for steak fries—very limp and soggy, and not thoroughly prepared. I would like to point out that, when I walked in, no one came to the counter for at least a minute. Looking around, I saw an unattended kitchen. During the entire time that I was there, I did not see or hear anyone except for the guy who took and gave me my order. If not for the title of this post, one would have expected the entire experience to be a train wreck. However, the actual Stevie Boy Burger made up for any shortcomings of the place. The burger is huge, consisting of a 1/3 lb. Angus beef patty, bacon, American cheese (no choice on cheeses, folks), jalapeños, a generous portion of avocado, shredded lettuce, tomato, pickle chips, and raw yellow onions, all on a decent bun with mayo. With most of the burgers I have sampled, this bun would have been sufficient; however, under the patty’s girth, the bacon, the mayo, and the juices (all-American grease! ), the bun broke down as I stuffed my face. By the time I got down to the last third of the burger, I was finishing it off by plucking the broken elements off the plate with my fingers. The Stevie Boy Cheeseburger is an excellent sandwich for its class, even if it can fall apart and be a nuisance to eat by the end. This one is one of the best burger-stand burgers in Sacramento. It lives up to its early reputation. I like Café Bernardo restaurants. I usually skip their Niman Range Natural Angus burger and go with their Grilled Chicken Sandwich or, if I am between meals, their Creekstone Natural Angus sliders. I reviewed Café Bernardo on 28th Street two years ago. 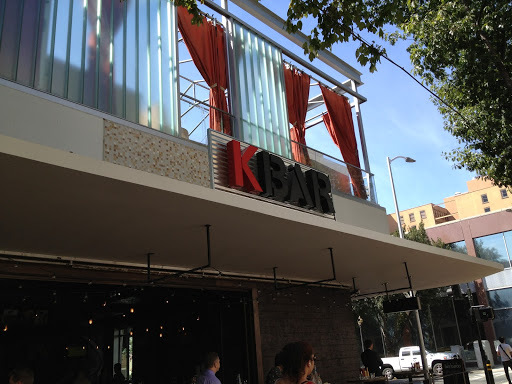 Not much has changed with the new Café Bernardo [http://www.paragarys.com/sacramento-restaurants/k-bar/], this one at 1000 K Street, Sacramento (also called K Bar). 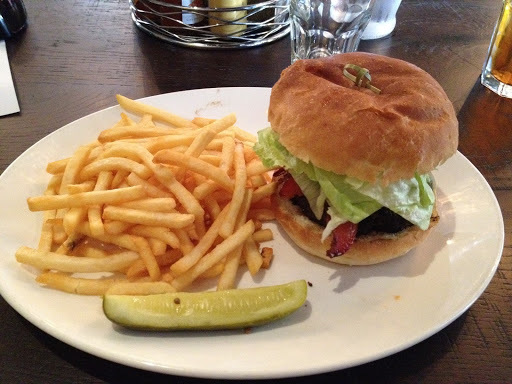 However, I did find a new burger when I dropped in to see if the new place offered the Grilled Chicken Sandwich. Alas, it did not. However, I did discover the Habanero Burger, which tastes similar to the burgers served at the other two locations that I have tried. popped for their excellent Grilled Chicken Sandwich. The difference with this burger is the taste of bacon and the spicier-than-usual cheese in each bite. The cheese used is the local and excellent Fiscalini cheddar (not pepper jack as noted on the menu), which contains habaneros rather than the more conventional jalapeños. The burger costs $11.75 and comes with a dill pickle spear and good fries. I bought an iced tea for $2.25. Also on the menu are the Niman Ranch Natural Angus burger, a house-made turkey burger, and a Black Bean burger with jack cheese, avocado, pickled jalapeno, tomato, and red onion. I returned the next day to try the Black Bean burger, which was fine but reminded me why I am not a vegetarian. Adding animal fat to a vegetarian burger would be a betrayal but would sure help! Next ›Is Egg on a Burger Overrated? Me Think So!